Although we recommend using Google Chrome for child check-in, you may find that it doesn't work for you, or you simply prefer another system. 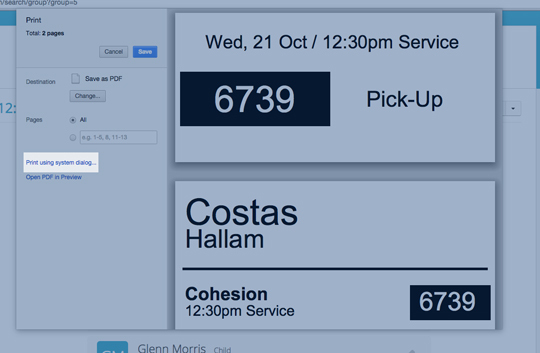 Child check-in/out without badge printing can run on any device or browser which supports ChurchSuite. Additionally, provided you have set your system up correctly, you'll be able to print labels from any browser as part of the check-in process. However the ease with which you'll be able to print depends on which operating system you have, Mac or Windows, and what browser you are running. If you are experiencing issues with a newly updated version of Chrome, one option is to downgrade back to an earlier version. Often updates are related to Chrome's security, so you should consider security-related consequences before downgrading, but in the context of Child Check-in, these consequences are likely to have little or no bearing. The following article (unverified) explains how to downgrade - click here. On all Windows browsers checking a child in should cause the print window to automatically appear. Simply click print, and provided your printer settings are correct, and the browser's print settings (if applicable) are also correct then your check-in labels will begin printing. However, it may be the case that you want to run your browser in " kiosk mode" whilst running your child check-in. Kiosk mode means that the child check-in operates in full screen mode, and cannot be easily exited - this is most helpful in unstaffed check-in scenarios where you wish to prevent tampering with the computer settings. Additionally, when "silent-printing" is also used, when you click to print the labels you are not asked to confirm - the system skips the usual print dialog and just prints the labels. For this reason, we strongly recommend you set Kiosk mode and silent printing up on the computer you are intending to use on a Sunday morning for child check-in. Unfortunately only a few browsers offer kiosk mode; one of the reasons we recommend using Google Chrome for your check-in as this offers a simple kiosk and silent print setup (but only on Windows devices). To configure Chrome for use in kiosk, follow the instructions in our support article on "Child Check-in". Outside Chrome there are two main browsers which we have used, which have fairly useable kiosk/silent print options. The best alternative to Chrome on Windows we've found is Chromium (the open-source, developers version of Chrome). We've put the installation in a dropbox file for you to make it even easier. Once Chromium is installed, type in the URL bar Chrome://flags. Then press Ctrl+F and type 'Enable Print Preview'; this should take you to "Enable Print Preview Registration Promos"; ensure this is enabled and then relaunch. Now you'll be able to Kiosk mode Chromium (following the same procedure as you would for Chrome) and silent print. Firefox works; however it is not an ideal replacement as the silent printing and kiosk features are provided as downloadable add-ons, rather than in-built features. As Firefox evolves with each new update, experience shows that extensions quickly become outdated, incompatible or stop working altogether. Firefox also seems to have different print settings to your default system settings. However, if you prefer Firefox then it is still a 'workable' browser for silent printing. To configure the print settings open the menu (the 3 horizontal bars in the top left), click on print and then select 'Page Setup' in the top left hand corner of the page. 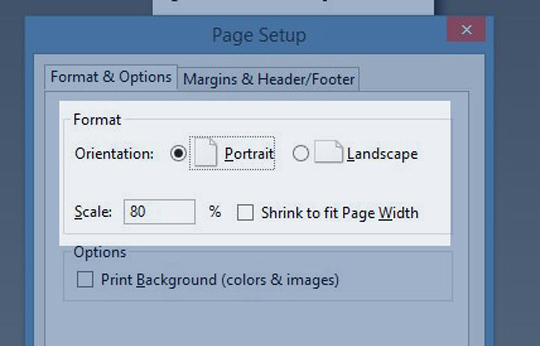 Ensure you switch page orientation to 'Portrait' and reduce the scale to about 80%. Also ensure that the Margins on the left are about 2.0 in the Margins tab. If possible try and print some test labels before usage to ensure it's set-up and calibrated correctly. After you've configured the printing settings, you'll need to install the Seamless Printing add-on; this will enable silent printing (just ensure that 'enable_seamless_print' is ticked in Seamless Print's extension options before opening each Check-in Session). Previously we have recommended mKiosk for Kiosk mode in Firefox; however with subsequent add-on updates, this add-on has become unusable in our testing. We've therefore ceased recommending or supporting it as a Firefox kiosk mode option. Unfortunately it is more difficult to print check-in labels from a Mac; sadly, it is not possible currently to print silently in kiosk mode using either Chrome or Chromium - both systems on Mac OS have no support in-built for silent print/kiosk (unlike their Windows browser equivalents). The only way you'll be able to print your check-in labels on Chrome or Chromium is through the system's print dialog. So when you go to check a child in, you'll still see the print window auto-appear, however you won't be able to print from it. Instead, you'll have to click 'Print using system dialog', and double check that all your print settings are correct (see the Child Check-In support article, which has a section on "configuring your Brother QL printer for Mac"). Once you've done all of that, simply click 'print' and your check-in labels will print. 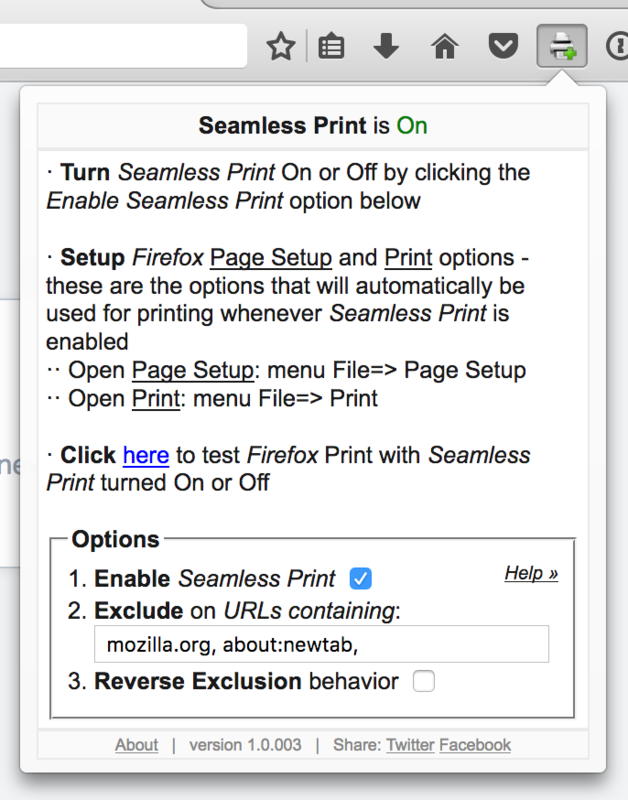 Due to the fairly complicated, and time-consuming nature of the print process in Chrome, we recommend that you use Firefox with the seamless print add-on if you are going to run your check-in from a Mac. Unlike on Windows, you won't need to fiddle around with the Firefox print settings before you get started, as it simply uses the system's print settings. Therefore all you'll need to do to get started is install the Seamless Printing add-on; this will enable silent printing (just ensure that 'enable_seamless_print' is ticked in Seamless Print's extension options). This will allow you to silently print.